Boston, 1770. John Adams is a successful lawyer who finds himself caught in a difficult position when he is asked to defend British soldiers accused of killing several civilians during a 'peaceful protest'. Since the protest was against Britain's increasing taxation of the colony whilst refusing it representation, the situation is inflammatory. Adams' sterling defence earns him a job offer from the colony's governor, which he turns down as King George III's policies towards the colonies become more repressive over the following few years. Adams is asked to help represent Massachusetts at the Continental Congress in Pennsylvania, where the debate quickly becomes centered on the question of full secession of the Thirteen Colonies from British control. With pro-British sentiment strong amongst some of the delegates, it falls to Adams and several unlikely allies, notably Dr. Benjamin Franklin and Thomas Jefferson, to push through the secession agreement and recruit Colonel George Washington to command the state militias. On 4 July 1776 the North American colonies declare independence from the British Empire, sparking the expansion of the armed struggle into a full-scale war. Over the next fifty years, Adams continues to serve the fledgling nation. He serves as a delegate to the court of King Louis in pre-revolutionary Paris, as the United States' first peacetime ambassador to the hostile court of George III in London, as the first Vice-President of the United States and then as the second President during a time of great controversy as the country is divided over the matter of siding with Britain in war against France. Through it all Adams tries to steer a course of intellectual debate and mediation, but finds that his irascible temper and intellectual vanity makes him many and easy enemies at home and abroad. His relationship with Franklin and especially Jefferson changes over time, but he is constantly advised by his loyal and intelligent wife, Abigail, on matters personal and political. John Adams is an epic HBO mini-series. 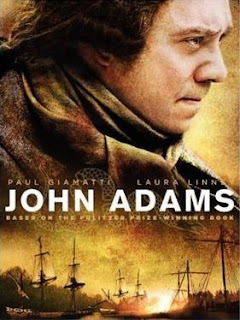 In the course of seven hour-long episodes, it charts the birth of the United States and the role Adams (Paul Giamatti) played in its formative years, culminating in his retirement and the election of his son, John Quincy Adams, as the sixth President. The events are vast, incorporating the Revolutionary War, the French Revolution and the impact of the French Revolutionary and Napoleonic wars on the USA's relations with both France and Britain (although the War of 1812 is not featured). Adams' various jobs are highlighted, from his not-so-humble beginnings as a skilled lawyer, his role in helping draft the Declaration of Independence to his tenure as Vice-President (where he becomes the first incumbent of the role to realise how powerless the position is) to his position as President, including being the first American head of state to live in the White House. Adams the politician, lawyer and peacemaker form one side of the story, but his personal life forms the other. His wife Abigail (Laura Linney) is frequently separated from her husband as his job calls him to Philadelphia for long periods and, later, takes him to Europe for several years. Abigail's role as the home-maker, the raiser of their children (whose own travails form the series' major subplots) and her husband's constant advisor, either in person or by letter, lends an important emotional context to the drama. The creators of this series are as keen on the story of Adams the man as much as the historical figure, which is vital to hold the viewer's interest over the course of seven hours. This is a talkative drama. With the exception of an engagement with a British frigate during his crossing to Paris and a later brush with illness in the Netherlands, Adams' life is not in jeopardy. The siege and battle for Boston is depicted briefly (helped by some superb CGI), but action elements are relatively light on the ground. The drama is fantastically acted by an A-grade cast acting at the top of their game and is superbly written. It is not completely historically accurate (lampshaded at one point when Adams rails against John Trumbull's famous painting, the Declaration of Independence, for being an artistic rather than literal interpretation of events) but the lengthy running time permits a much closer adherence to historical fact than say a two-hour movie would have. The only moment where the historical deviances seem incongruous is when Adams and Jefferson's strained relationship is repaired by Abigail's death and it is suggested they only have a brief period of reconciliation afterwards, whilst in reality they began corresponding six years before Abigail's passing and continued to do so until their own deaths eight years later. This feels a little too close to cheap sentiment, at odds with the deeper drama that makes up most of the mini-series. Of course, the element I suspect most viewers will think is a ludicrous dramatic convenience is actually completely true: both John Adams and Thomas Jefferson died within a few hours of one another on the 50th anniversary of the declaration of independence. The actors are superb. Paul Giamatti plays Adams as irascible, arrogant, hot-tempered and prickly, but also a loving husband and father and deeply concerned for the well-being of his country. He is not always likable, but then neither was Adams. Laura Linney, who won an Emmy for her performance, is excellent as Abigail, portraying her as a strong and resolute woman occasionally resentful of her husband's long absences but also understanding of the magnitude of the times they are living in. Tom Wilkinson is likewise brilliant as the elderly Benjamin Franklin, whilst Stephen Dillane brings gravitas and intelligence to the role of Thomas Jefferson. If HBO ever do a companion series on the life of Jefferson, they should re-recruit Dillane immediately. Less well-served is Rufus Sewell, a tremendously skilled and capable actor, who is distinctly under-used as Alexander Hamilton and not given much of a deep character portrait. In addition, Tom Hollander has an excellent cameo as King George III, but plays him as if he's almost gone mad already, although his full descent into insanity did not begin until several years later. For the most part, the casting is exemplary. John Adams (****½) is an epic, rich and gripping political and character drama, marred only by some minor acting and writing choices that don't entirely work. But, hinged on the superb performances of Giamatti, Linney, Wilkinson and Dillane, it is for the most part must-see TV. It is available now on DVD in the UK and USA (and also on Blu-Ray in the USA). I watched this every week when it was on TV. GREAT (note the caps) show. I just wish they could have made it last longer. I thought the first 3 episodes were great but the remainder were a let down and a bit of a drag to be honest. I was expecting it to be a build up to him being president but it was a let down once he got there. I guess it's the curse of following someone's entire adult life relatively accurately. By the final episode it was a case of watching and waiting for him to die rather than see what interesting developments may occur. Being British I don't know a great deal about American Independence but i thought it was handled in a very balanced and interesting way. I had feared it would be overly patriotic but I should have had more faith in HBO. There were some great performances in there by Giamatti, who made Adam's a stand up, yet petty man and Laura Linney who was excellent as the wife (who should have been president if it had been allowed back the). One minor quibble was with the shows stange obssession with overly loud insect noises, which became really distracting in places. For me the show peaked with episode one, was good until the end of the war and then became very dull. Still worth a look and I imagine if you're American it will be even more enjoyable.